Uefa boss Michel Platini has been asked by a majority of world football chiefs to stand for the Fifa presidency. Platini is said to have had assurances of support from his own confederation, Asia, South America, plus North and Central America and the Caribbean. 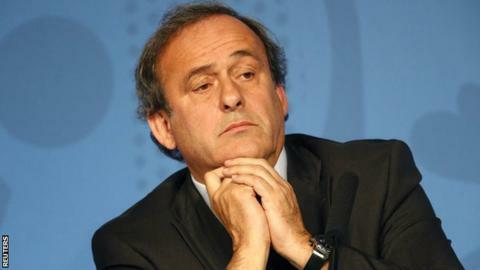 It is thought 60-year-old Platini has yet to decide if he will stand. Fifa president Sepp Blatter said on 2 June he would stand down and on Monday will announce plans for reform of football's world governing body. On Monday, Fifa announced it will hold an extraordinary congress to elect a new president on 26 February 2016. Blatter, 79, was elected for a fifth term as president on 29 May but four days later announced his intention to relinquish the post amid two corruption investigations. Former Fifa presidential candidate Prince Ali bin al-Hussein, who lost to Blatter in the May election, has called for the Swiss to leave immediately. "President Blatter's resignation cannot be dragged out any longer. He must leave now," said the 39-year-old, who has been president of Jordan's national football body since 1999 and gave no indication whether he intends to run again for the presidency. "He cannot be permitted to plan his succession and manage this election process. An interim independent leadership must be appointed to administer the process of the elections, in addition to the reforms that are being discussed prior to the elections." Blatter is not expected to backtrack on his announcement to stand aside as president, despite appearing to suggest in June he was reconsidering his decision.